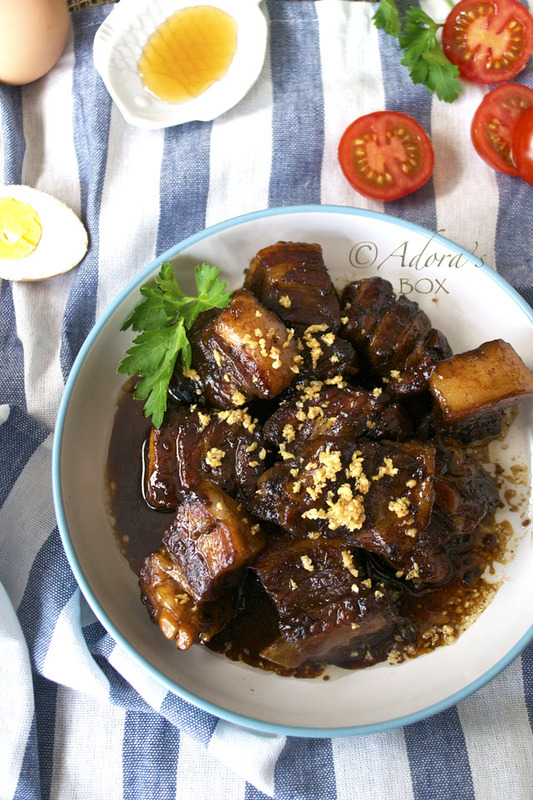 If there is one dish that a Filipino should learn how to cook, it should be adobo. It is the quintessential Filipino cuisine. 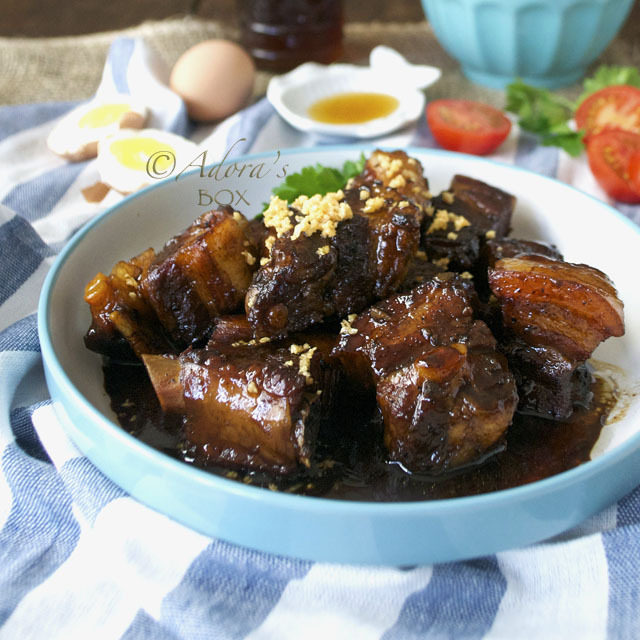 It is a very simple dish with only a few ingredients, yet every adobo is as different as the person who cooks it. 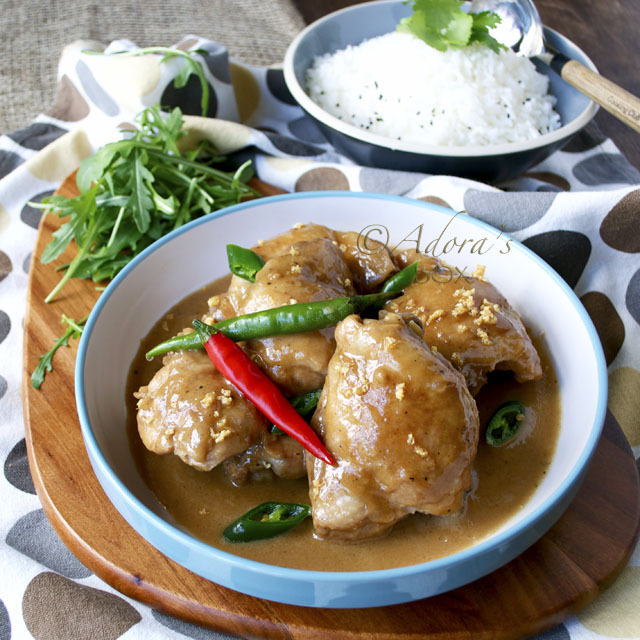 Although chicken adobo is more known outside the Philippines, it is pork adobo that is the original dish and more loved by the native folks. 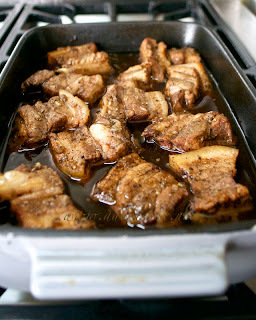 This is due to the fact that filipinos are avid pork lovers and there is probably no better way to cook pork but as adobo. Back home, pigs are happier, tastier but fattier. The belly, especially, has a very thick layer of fat. 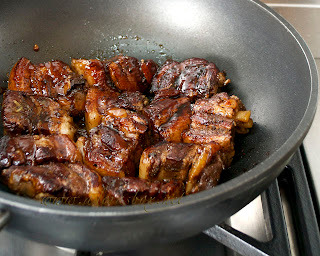 When cooked as adobo, these fat melt and and help caramelize the sauce while keeping the meat succulent. I used to hate this dish because I found it too fatty. Thankfully, the pork here in the UK is a lot leaner. 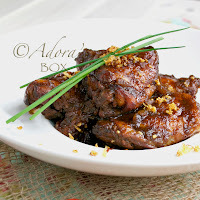 A reasonable amount of fat is essential to the taste and texture of a proper adobo. I use bone-in belly rashers which has both the bone and fat layers that make any stew extra delicious. When the dish is done and the fat has helped to develop the taste of the dish, it can be skimmed or trimmed off. My adobo is very basic and has the three essentials: garlic, vinegar and soy sauce. This dish was invented in the pre-refrigeration days and those ingredients were intended to pickle the meat so it won't spoil. A good adobo should not taste acidic. I use balsamic vinegar because that has a mellower and sweeter flavour than cider or white wine vinegar. Some people add in a bay leaf but in the town I come from that would make it a different dish (asado). 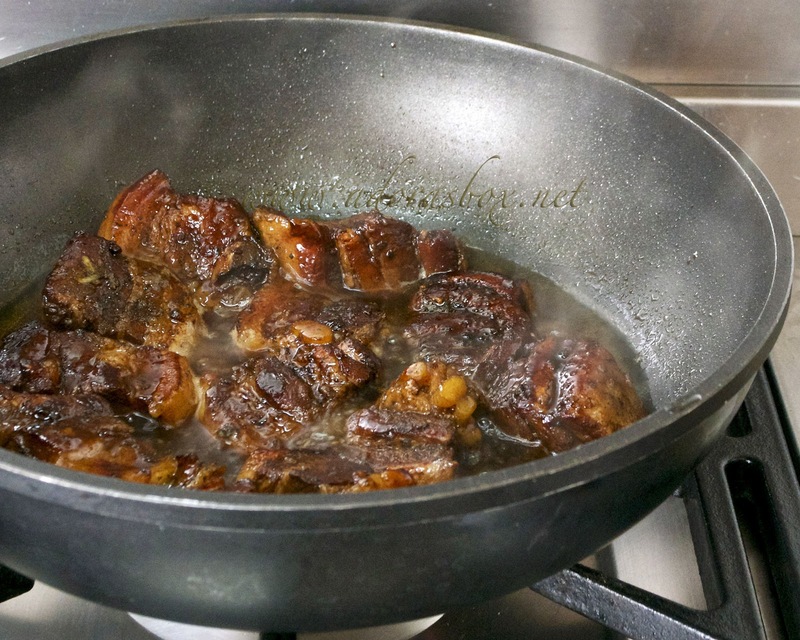 Although it is a very simple dish, it is the process that makes one adobo different from the rest. For me, it has to have a sweet caramelized sauce. This counterbalances the acidity of the vinegar. After stewing the adobo in the marinade, I "fry" it in brown sugar. This step makes the fat render, browns the meat and gives the sauce a caramel taste. A final sprinkle of toasted garlic gives the dish another nuance of its flavour. 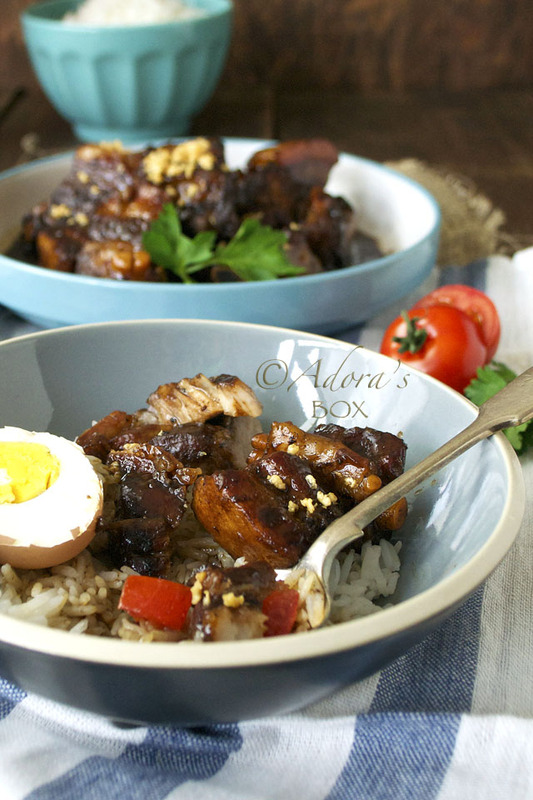 Adobo is a dish that is so good with rice. Fish sauce is always offered even if the dish is seasoned enough. I like eating mine with tomatoes and boiled or fried eggs. A true blue Filipino's mouth would have watered on reading the previous paragraph. This recipe can be cooked on the stovetop or in the oven. Put all the ingredients, except for the water, sugar and fried garlic in a bowl or dish. Mix well and leave to marinate for at least 30 minutes. If cooking on the stovetop, transfer the meat and marinade to a pan. Add the water and bring the mixture to a boil and simmer on low heat for an hour or until the meat is fork tender. If cooking in the oven, omit the water. Put the marinated pork, including the marinade, in an oven proof dish. Cover tightly with foil and bake at 350° F/175° C for 1-2 hours until fork tender. 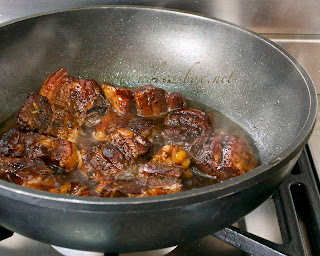 In a dry, clean pan, caramelize the brown sugar. Add the meat and stir until the meat is browned and glazed with the sugar. Add the sauce and simmer on medium heat until the sauce is reduced. To get a rich deep taste, the sauce has to be reduced until syrupy then add a bit of water to make a sauce. Sprinkle with the fried garlic before serving. This looks wonderful, Adora. I have never tried this dish before but I really need to try it... pork in a sweet vinegary sauce?? Works for me! Another true blue adobo recipe, i must learn this one. Thanks for sharing the little details that will make this dish even better, i didnt know the part about the fat carmelizing the sauce. Yum!! This looks delicious!!! Never tried it like this but cant wait to! This looks wonderful! Thanks for posting. The caramelized sauce sounds delicious! What a wonderful yet simple recipe! You are making me crave for Adobo. I have never tried using balsamic vinegar, I always use coconut vinegar. Hmmm ... may just have to try it. Yuuuum! I've only even made chicken adobo (I didn't even know there was such a thing as pork adobo) and I LOVE pork! I'm trying this as soon as I can! That is such a succulent pork dish, just inviting to sit and dig in! Although we don't eat pork, this dish is looking very tempting to me. Will this recipe work if I use lamb instead of pork? I have never tried it on lamb but I don't see why not. 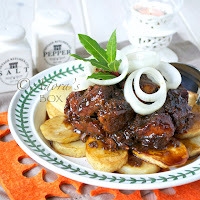 Beef is also good for this recipe. I had never heard of Filipino adobo until a year ago and now I am a huge fan. I love that sweet, vinegary flavor. 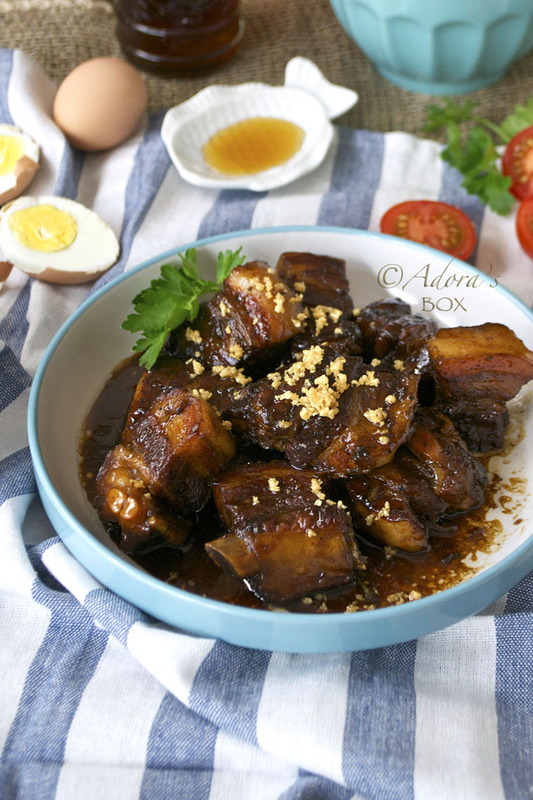 Your pork adobo looks fingerlicking good and the egg on top sounds perfect to me! I used Pearl River Bridge Light Soy Sauce but any brand of light sauce will do. Pork, as with other meats, has no specific time frame for cooking. It can be calculated but always depends on the cut and the age of the meat. While being fork tender means it's cooked, belly pork can stand a longer cooking time, depending on your preference. Hi Adora! 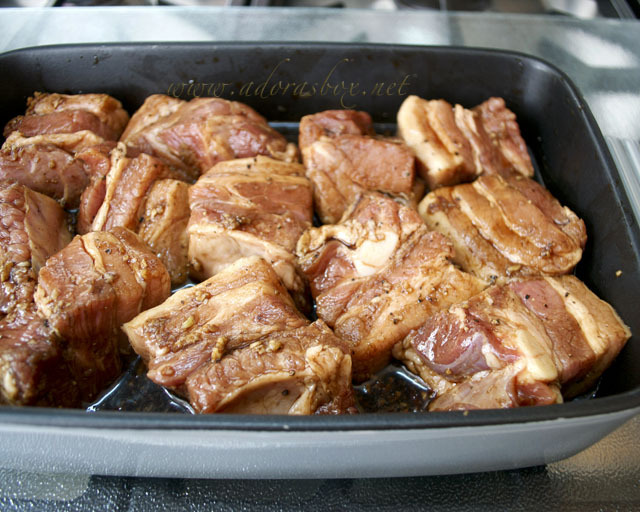 This Adobo looks soooo good. I've always cooked adobo with the Filipino brands of soy sauce and vinegar (Silver Swan or Datu Puti). Is Kikkoman considered light soy sauce here? I never thought it would taste good with adobo. Yes, you can use Kikkoman instead of light soy sauce. It's not the same but is a suitable substitute.